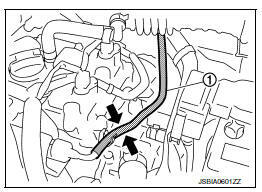 Fuel pressure pulsation should be felt on the fuel feed hose for 1 second after ignition switch is turned ON. NO >> Proceed to EC-453, "Diagnosis Procedure". Check the continuity between IPDM E/R harness connector and ECM harness connector. Disconnect fuel pump harness connector. Check the voltage between fuel pump harness connector and ground. Disconnect 15A fuse (No. 50) from IPDM E/R. NO >> Replace 15A fuse. Check the continuity between IPDM E/R harness connector and fuel pump harness connector. Check the continuity between fuel pump harness connector and ground. Check fuel pump. Refer to EC-455, "Component Inspection (Fuel Pump)". NO >> Replace fuel filter and fuel pump. Refer to FL-6, "Exploded View". Is the inspection result normal? YES >> Replace IPDM E/R. Refer to PCS-30, "Removal and Installation" (With intelligent key) or PCS-58, "Removal and Installation" (Without intelligent key). Disconnect fuel level sensor unit and fuel pump harness connector. Check resistance between fuel pump terminals as follows. NO >> Replace fuel filter and fuel pump. Refer to FL-6, "Removal and Installation".